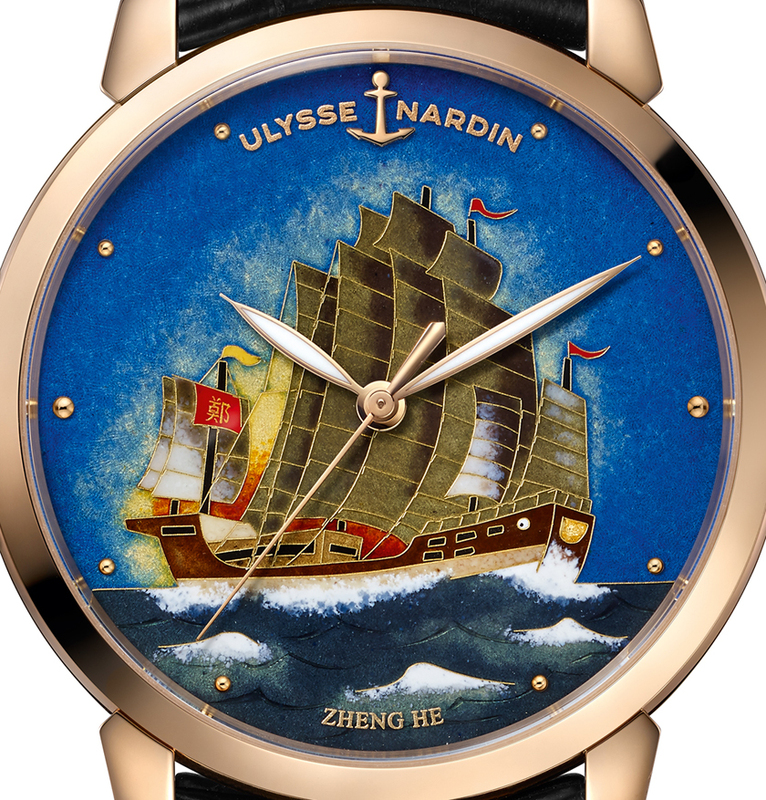 Saluting the fascinating world of Chinese maritime history, Ulysse Nardin honors the Zheng He Treasure Boat in its new Classic Collection limited-edition enamel cloisonné timepiece. The Chinese Treasure Boat (or Bao-Chuan) was a type of large wooden ship in the fleet of admiral Zheng He, the renowned explorer and mariner, who led seven voyages during the early 15th-century Ming Dynasty. These massive ships were 137m long and 55m wide, with nine masts and four decks for up to 500 crew as well as cargo. While they were few in number, Zheng He's voyages covered extensive territory, traveling through Southeast Asia to faraway Africa and Arabia. With a fleet numbering hundreds of ships, and crews of around 30,000 men, his was easily the biggest maritime expedition of that time. Between 1405 and 1433, Zheng made a total of seven voyages, visiting 37 countries, an incredible achievement for the time. The case, in 18kt rose gold, measures 40mm. It has an AR-coated sapphire crystal, a sapphire display back, and it is water resistant to 50 meters. Movement is the Swiss automatic Ulysse Nardin caliber UN-815 with 21 jewels, 28,800 vph and a power reserve of 42 hours. It is COSC-certified as a chronometer. Enamel cloisonné dail with the "Zheng He Treasure Boat" motif. Gold hands. 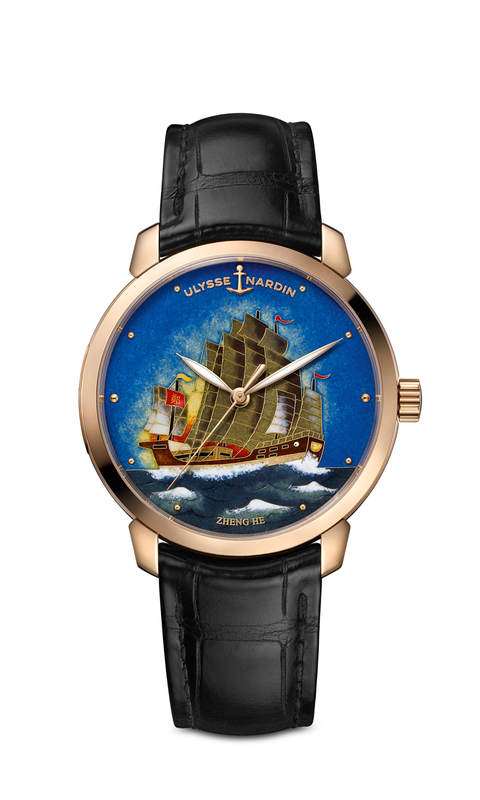 To accurately portray the appearance of the ship, Ulysse Nardin called upon its in-house enamel specialists Donzé Cadrans for the work. Craftsmen employ fine gold wire to create the compartments, within which the enamel is carefully deposited. Every cloisonné dial involves immense effort and patience, requiring 50 hours of artisanal expertise and 26 separate processes to bring a scene to vivid life. It comes on a black alligator leather strap with an 18kt rose gold buckle.